There is a guy called Behrokh Khoshnevis, an USC engineer, who is trying to build a giant contour crafter, a device that should be able to build houses in twenty four hours and without the need of human labor. The contour crafter, in fact, works similarly to traditional printers. 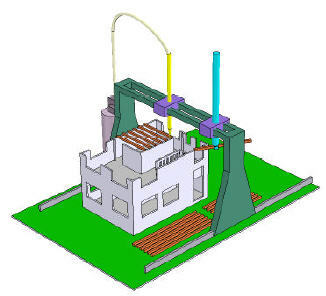 It receives information from a computer and then a robot squirts layers of semi-liquid construction material to build up vertical walls and domed roofs. Now, if you are already thinking “that is a heck of a creative (crazy?) guy”, you have not seen the whole deal. Khoshvenis is also planning to use his giant printer to proceed with the colonization of the moon! I think that we run out of space in cities soon with this idea. With such easy machines, loans for workers go down, which make building a house cheaper. Which results in bigger houses for the same price. And when you can just design it, you design the largest house possible, and it’ll be there within one week (as the article says). Houses are build quicker, bigger, cheaper. Nice plan, wondering if it can be produced, but I think it’ll be a problem.